April's Little Family: I May Have an Addiction to Craigslist. I May Have an Addiction to Craigslist. ...and I may have (grossly) overestimated the size of our family room in making this purchase. p.p.s. Today is the last day to enter my Father's Day Giveaway!!! wow...that's a huge tent!!! and craigs list is a fun place to get some deals! the rest of her posts are awesome too, I love the idea of thinking about how kid's nutrition is different than adults! who needs room to sit anyway. He probably thinks it's a perfect fit! A shady place to play outside? I know it's been so hot, but maybe, you never know. 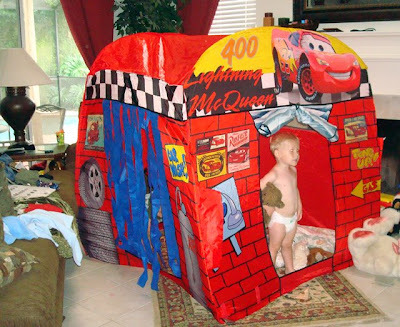 Nick had a Harry Potter play house like this, well not so large, but similar..........it was loads of fun! you need to hear that new al yancovich song called "Craigslist" it is sooo funny. Cute tent@! This is fantastic. I need one.